A Minneapolis eye surgery company and its former CEO have agreed to pay $12 million to resolve a whistleblower case which alleged that the company made illegal kickbacks to physicians in exchange for their business. Sightpath Medical is a subsidiary of TLC Vision Corporation, a privately-held Canadian company and provider of the popular Lasik eye correction procedure. Sightpath specializes in products and services in eye surgery centers and doctors’ offices that offer services that can be paid for by federal healthcare programs, such as Medicare. The company operates in both the United States and Canada. According to the allegations filed by the U.S. attorney’s office, Sightpath Medical provided the kickbacks from 2006 to 2015 to entice doctors to use its products and services, which were then billed to government health care programs such as Medicare. The government also accused Sightpath also entered into lucrative consulting agreements with physicians and physician practices for services that were never performed or not properly documented, resulting in payments “in excess of fair market value”. The Office of Inspector General of the U.S. Department of Health and Human Services and the FBI investigated the case, which started as a whistleblower case brought by former Sightpath employee Kipp Fesenmaier in 2013. The lawsuit claimed that between January 1, 2006 and January 1, 2015, Sightpath hosted luxury hunting, skiing, fishing, and golfing trips, and offered “lucrative consulting agreements” with physicians and physician practices. The lawsuit claimed that services that were never performed or not properly documented, were nevertheless charged to Medicare, resulting in payments “in excess of fair market value”. 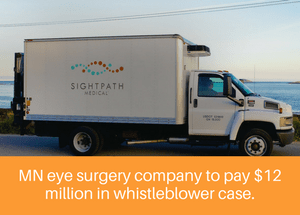 The whistleblower case alleged the trips and consulting agreements were used as a way to bribe physicians to use Sightpath’s products in their practice, including the mobile cataract surgery equipment and eye surgery procedures that would be covered by Medicare. Former Sightpath CEO James Tiffany was also a defendant in the lawsuit, which alleged that these acts took place with his full knowledge and cooperation. Inducing physicians to use a company’s services or products by using kickbacks is considered a violation of the Anti-Kickback Statute and the False Claims Act. Under the provisions of the False Claims Act, whistleblowers are entitled to receive between 15 and 30 percent of the monies recovered in a successful qui tam lawsuit. The whistleblower in this whistleblower case, Kipp Fesenmaier will receive $2.3 of the $12 million settlement.